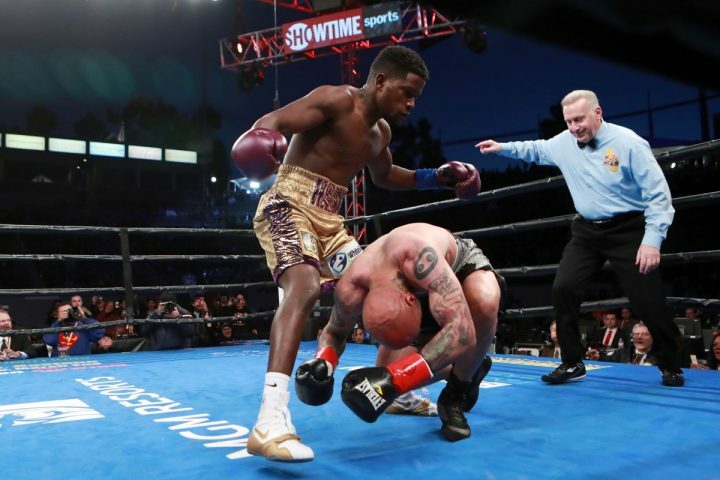 By Mike Smith: Junior middleweight contender Erickson Lubin (20-1, 15 KOs) completely destroyed 40-year-old former IBF 154 lb champion Ishe Smith (29-11, 12 KOs) by a third round knockout on Saturday night at the Dignity Health Sports Park, in Carson, California. Lubin, 23, knocked the over-matched older fighter Smith three times in round 2, and then a final time in round 3 before his corner had the fight stopped. Smith barely made it out of round 2. Surprisingly, referee Jack Reiss didn’t step in and stop the contest, which he probably should. This is the same referee that didn’t stop the Deontay Wilder vs. Tyson Fury fight in the 12th round after Fury was dropped and appeared to be unconscious four several seconds. It was a good win for Lubin, who was too young, too strong and too talented for the aging 40-year-old Ishe. The defeat for Smith was his third consecutive loss since 2017. Before tonight, Smith had been beaten by Tony Harrison and Julian ‘J-Rock’ Williams in his last two fights. Those were both decision losses though, and not the slaughter that we witnessed tonight with Smith getting pasted by the younger Lubin. For Lubin, it was his second straight victory since being stopped in the 1st round by former World Boxing Council 154 lb champion Jermell Charlo in October 2017. Lubin fought just once last year in defeating Silverio Ortiz. Lubin would obviously like to try and avenge his loss to Jermell Charlo if he could get a shot against. Jermell is heading towards a rematch against Tony Harrison to try and recapture his WBC junior middleweight title that he lost last December. Lubin is going to have to keep winning before he eventually gets a crack against Charlo. Ishe might want to start thinking about retiring from the sport. It’s been six years since Smith pulled off a huge upset in defeating Cornelius Bundrage by a 12 round majority decision to win the International Boxing Federation junior middleweight title. Since that fight, Smith has lost to Carlos Molina, Erislandy Lara, Vanes Martirosyan, Julian Williams, Tony Harrison and Lubin. Unbeaten lightweight Juan Heraldez (16-0, 10 KOs) stopped Eddie Ramirez (17-3, 11 KOs) by a seventh round knockout. in the 7th, Heraldez caught Ramirez with a big right hand that knocked him flat. The fight was then halted by the referee. The official time of the stoppage was 2:30 of round seven. Light welterweights Maurice Lee (9-1-2, 5 KOs) and Lennard Davis (4-1-5, 3 KOs) fought to a six round draw. The scores were 57-55 for Lee, 56-56, and 56-56. Unbeaten super bantamweight prospect Israel Luna (2-0-1, 1 KOs) defeated journeyman Angel Carvajal (2-11) by 4 round unanimous decision. the scores were 40-36, 40-36, and 39-37.